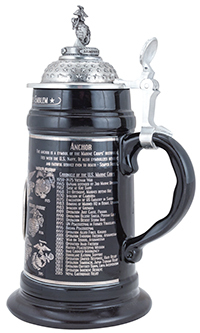 This stein features the United States Marine Corps "Globe and Anchor" logo as a metal medallion on the front/center of the stein body. Left side of stein describes symbolism of the eagle, center of stein describes symbolism of the globe, and the right side of the stein describes the symbolism of the anchor. 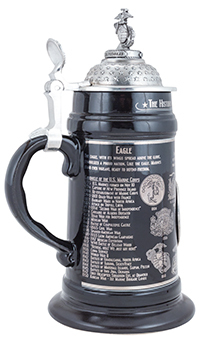 A timeline on the left and right side of the stein provides an overview of the history of the logo, from its inception through the version used today. These various iterations of the logo are shown on either side of the medallion. The lid features a three-dimensional, sculpted Globe and Anchor.